We’re passionate about food and hiking. And when paired together, we’re in heaven. In the last few years, we’ve developed a love for hiking for food. We can appreciate the experience of hauling our own meals up a mountain. But how glorious is it to reward yourself with a delicious feast during a hike – one that you didn’t have to prepare? Or go on a wine tasting hike? As we travel the world, we’re actively seeking out the best culinary hiking trails. Culinary hikes are those that combine the art of food with the beauty of nature. Several hikes listed below are thematic culinary trails, while others are culinary hiking destinations. Read on to find out where you can embrace epicurean pleasures with the glorious outdoors. Hochschwab mountain is the highest point in the Hochschwab mountain range in the Northern Limestone Alps of Austria. The dome-shaped mountain is a fantastic hiking destination for those seeking beautiful mountain scenery, wildlife viewings of ibex and chamois, and delicious food. 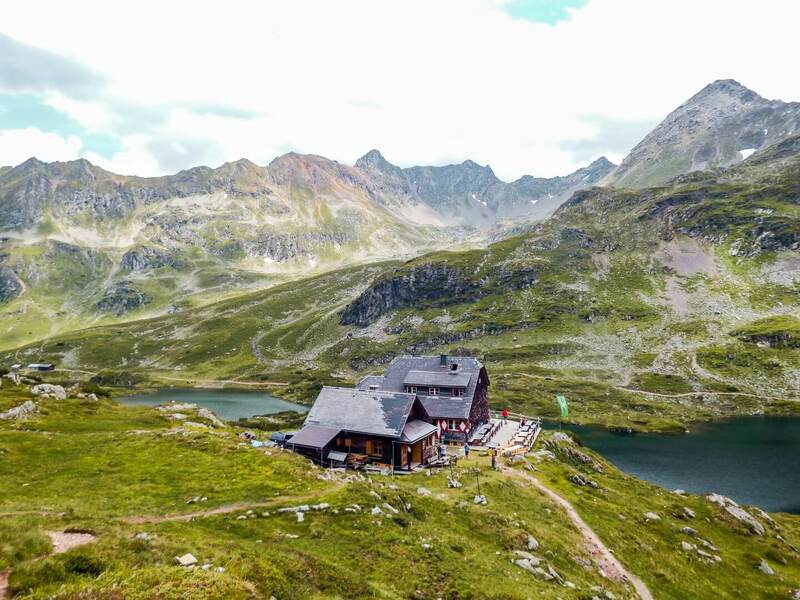 You can hike to the summit and overnight in the modern mountain refuge, Schiestlhaus, which is located directly below the summit. The hut’s bright and cheerful interior offers a lovely place to dine. Most mountain huts in Austria only offer traditional food, but Schiestlhaus serves up the traditional fair alongside more fusion-styles. The Schladminger Tauern High Trail (Höhenweg in German) is an epic multi-day hike in the Austrian Alps. The trail runs along the summits and ridge lines of the Schladminger Tauern mountains and drops into idyllic valleys and alpine cirques. We hiked 5 stages of the trail, but it’s easy to shorten the hike and only tackle 1, or 2 stages. As you hike from hut-to-hut in this beautiful region of Styria, you’ll always have a delicious meal at the end of the day. Culinary highlights of this trek included the Kaiserschmarrn at Keinprechtshütte and the Schweinsbraten at Preintalerhütte. 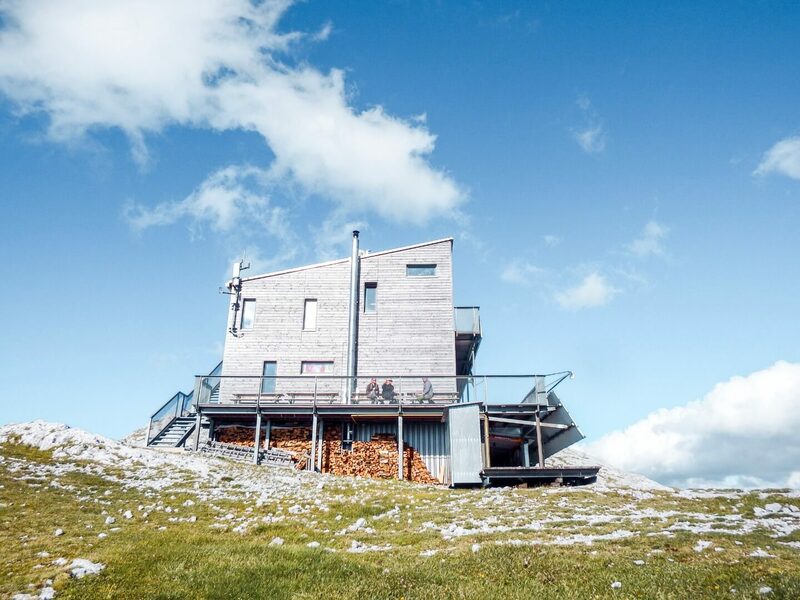 Tierser Alpl Schutzhaus (Rifugio Alpe di Tires) is an exceptional mountain hut located in the Naturpark Schlern – Rosengarten (Sciliar – Catinaccio Natural Park) in the Dolomites and makes for a great culinary hiking destination. Tierser Alpl specializes in Tyrollean cuisine with Mediterranean influence. To reach this mountain refuge, you’ll hike through the high alpine plateau Seiser Alm, to the mountain ridge Rosszähne (Denti di Terrarossa), and over the pass to the red-roofed Tierser Alpl. You can hike here for lunch, or better yet, stay the night. Imagine eating a delicious three-course meal with wine after a three-hour hike. 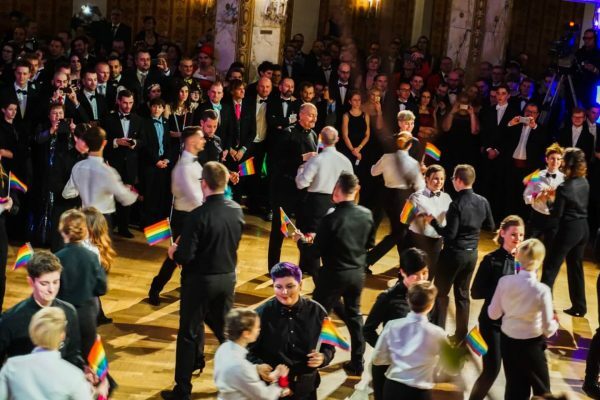 What to Eat: Speckknödel (dumplings with bacon), Rindstafelspitz mit Röstkartoffeln (boiled beef in broth with roasted potatoes) and any of their homemade cakes. Büllelejochhütte (Rifugio Pian di Cengia) is a charming mountain hut that dishes up some mind-blowing food in Tre Cime Natural Park (Drei Zinnen). To reach this spectacular hut, take trail no. 101 from the famous Dreizinnenhütte. 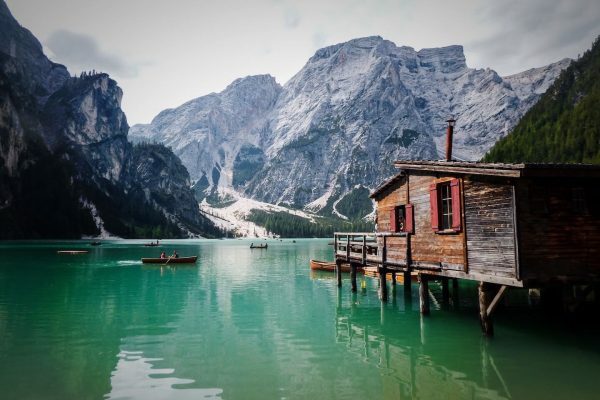 The mountain hut Dreizinnenhütte faces the north-side of the iconic three peaks – Tre Cime di Lavaredo – and also offers hearty South Tyrollean cuisine. The trail to Büllelejochhütte begins with stunning views of the two Bödenseen lakes (Lago dei Piani) and traverses a treeless rocky landscape beneath the mountain Paternkofel. Büllelejochhütte serves a three-course dinner for overnight guests. The quality and presentation of the meals exceeded our expectations. Seated in a cozy wooden dining space, dinner is served at a specific time, where all hut guests eat together. Amazing experience!! The Adolf Munkel Trail in Villnöß (Val di Funes) is an easy hike that takes you to the foot of the Geisler (Odle) Peaks in the Dolomites. From Zanser Alm, the trail slowly ascends along a small stream with epic views of the Geisler Group. 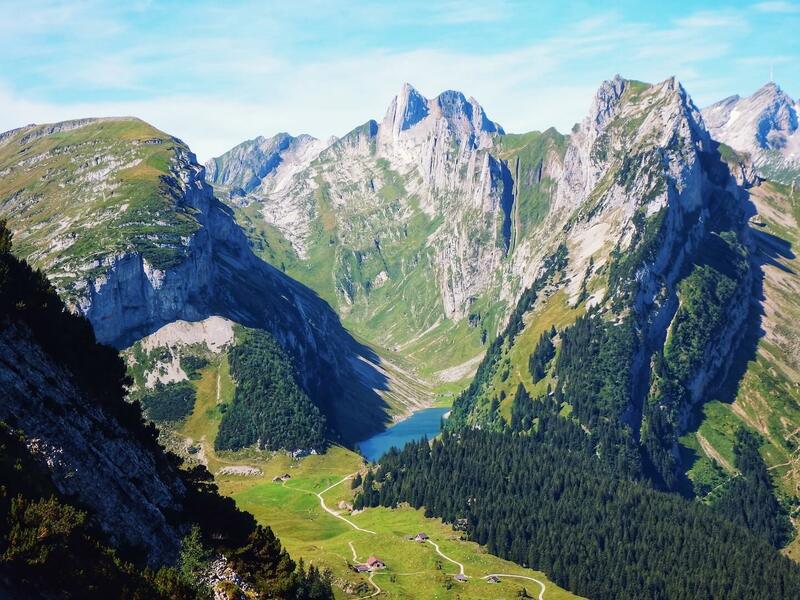 After hiking beneath these impressive peaks, the trail leads you to a high alpine pasture, where you’ll see a happily situated mountain hut Gschnagenhardt Alm (Malga Casnago). Here, you can relax outside, eat lunch, drink beer and enjoy the unparalleled view of the Odle peaks. The Ahr Valley (Ahrtal in German) is a region in Rhineland Palatinate and North Rhine-Westphalia that surrounds the narrow River Ahr. 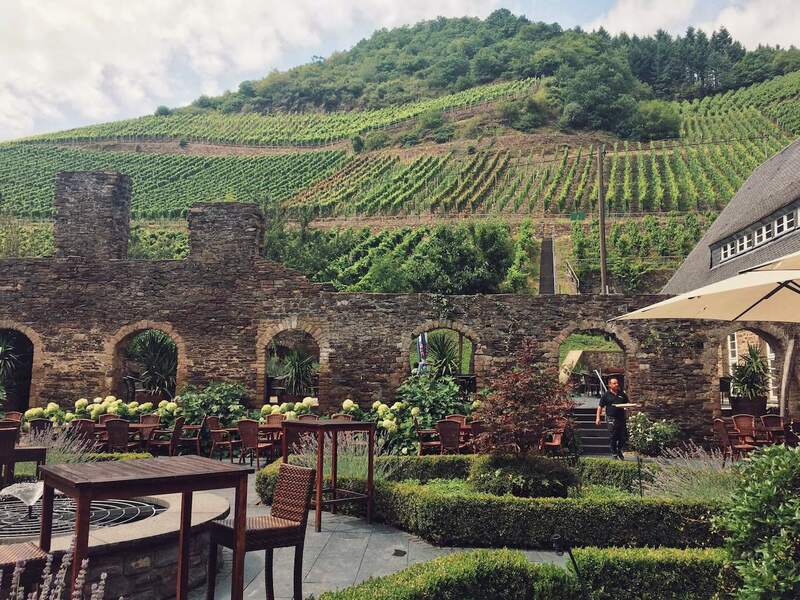 It’s also Germany’s largest red wine growing region. The best way to experience the Ahrtal is by drinking wine, and even better, by hiking the Red Wine Trail (Rotweinwanderweg) while drinking wine. We recommend starting the hike in Altenahr and ending in Dernau. 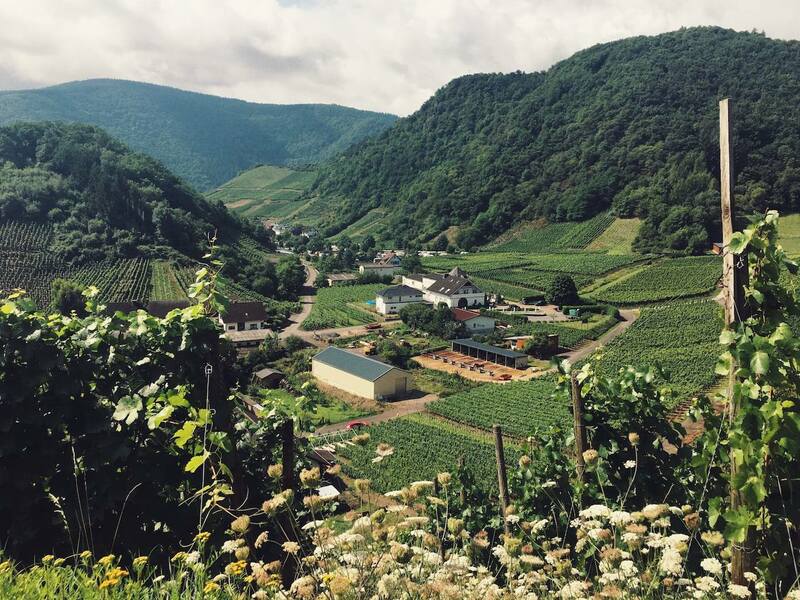 While the region is famous for its reds, the Spätburgunder Blanc de Noir white wines were the ones that impressed us the most. Built into the side of the mountain, Berggasthaus Äscher is one of those places that romances you at first sight. 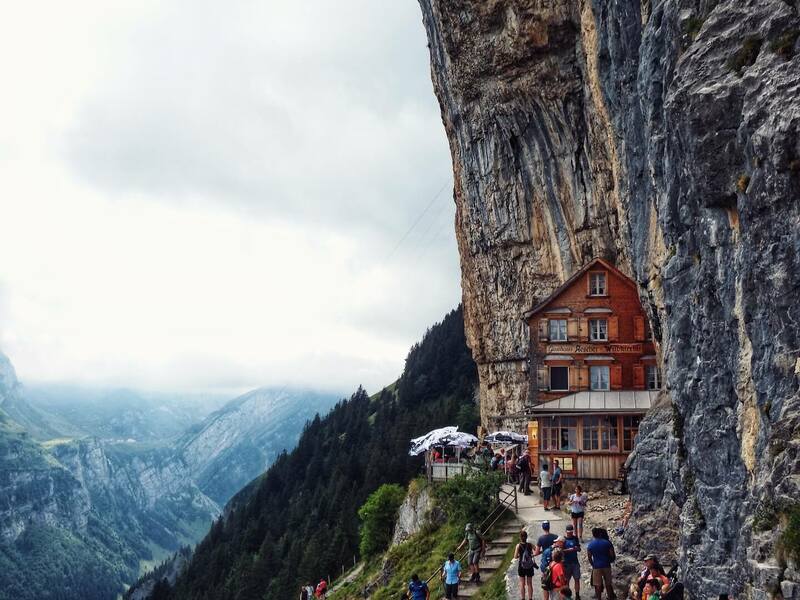 This photogenic mountain guesthouse is a rewarding place to eat lunch after a strenuous hike in the Alpstein in north-eastern Switzerland. You can reach this mountain inn by hiking from Seealpsee (beautiful alpine lake), or by taking the Ebenalp Cableway up to the summit of the mountain and hiking down to Äscher (20 minutes). Where to Eat: Berggasthaus Äscher. 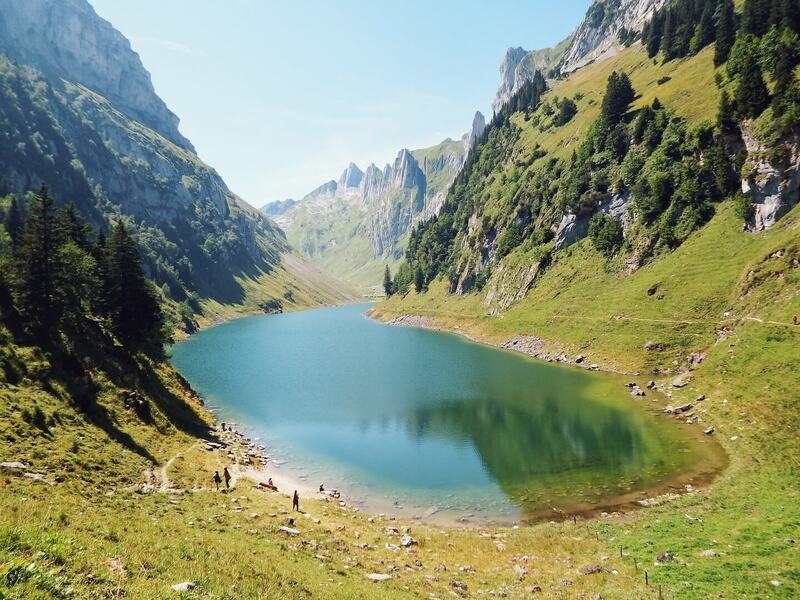 You can also buy cheese directly from the local dairy farms along the trail and have a picnic at Seealpsee. What to Eat: Appenzeller Cheese, Rösti (hash browns). 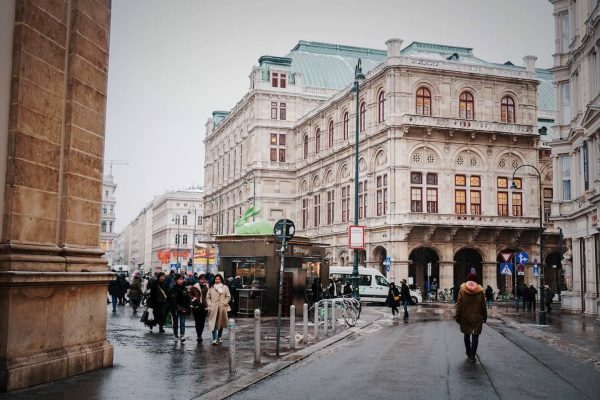 You can order Rösti with eggs, Appenzeller cheese (recommended), and bacon. 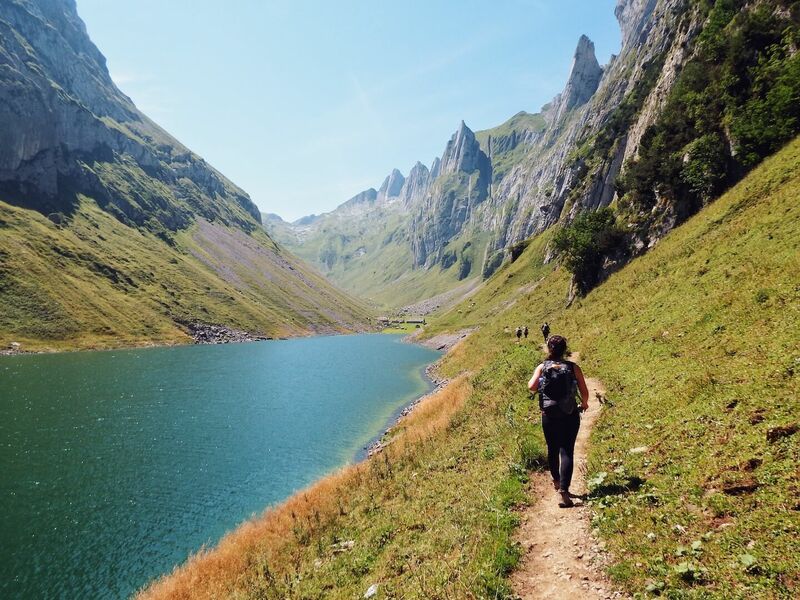 Learn More: Appenzellerland Travel Guide. Trail details are in the “What to Experience” section. Bollenwees is a mountain guesthouse and restaurant located at the fairytale lake Fählensee in the Alpstein. 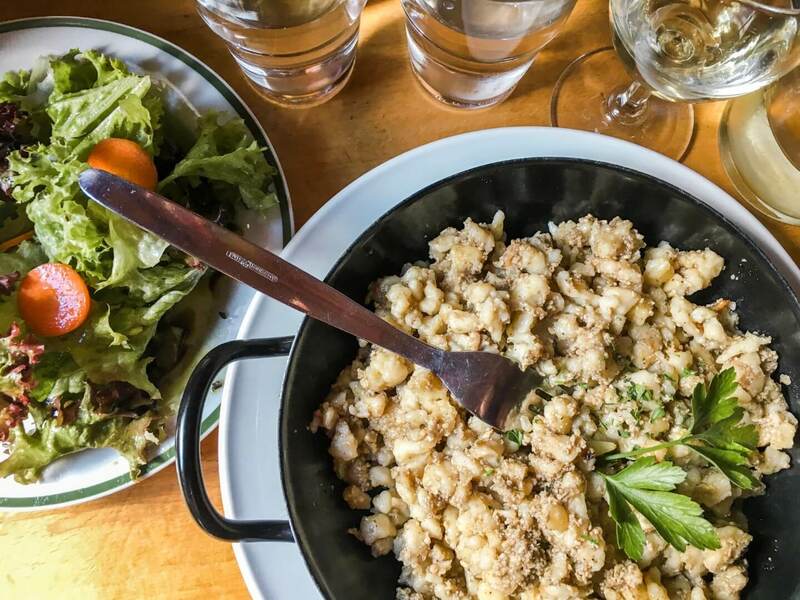 We recommend beginning this culinary hike at the Hoher Kasten tram station. From the summit, you’ll have an incredible panoramic view of the Rhine Valley, Appenzellerland, Lake Constance and surrounding mountain ranges. As the trail descends, you’ll have epic views of Sämtisersee lake, Fählensee lake, and the mountain Kreuzberge. When you reach Fählensee, reward yourself with a much-deserved Rösti at Bollenwees. What to Eat: Appenzeller Cheese, Rösti (hash browns). There are some affiliate links in this hiking guide. If you make a purchase using the links, we’ll get a small commission at no extra cost to you. It’s how we cover the costs of running the blog!